Turn on the waffle maker to your desired waffle crispness level. (I prefer mine golden with a slightly crispy exterior). If you’re keeping them warm, preheat oven to 200°F. Combine the dry ingredients. In another bowl, whisk together the buttermilk and the eggs. Create a well in the dry ingredients by pushing them to the outer edge of the bowl, forming a “hole” in the middle. Pour in the egg mixture. Whisk until ingredients just combined, with no clumps. Pour butter in a slow stream, stirring until butter is incorporated. 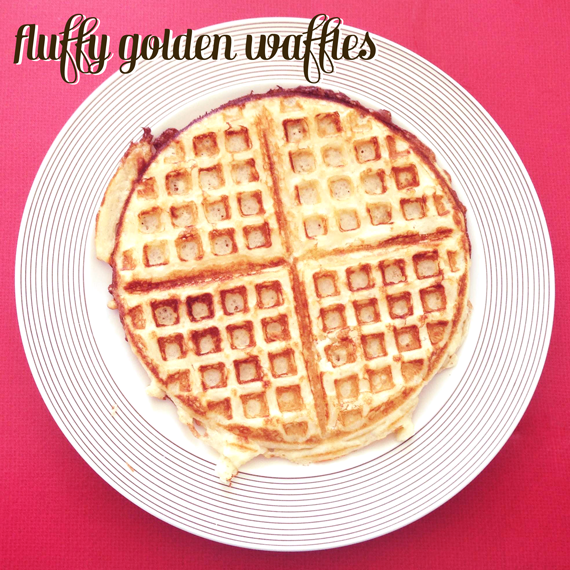 Pour 1/2 cup of batter into waffle iron and make waffles! Keep warm in preheated oven on a baking sheet. Serve with melted butter, maple syrup, fruit and/or whipped cream. « Kitchen Road Trip: Washington, D.C.